This is a covers record. However, unless you have spent hours in an attic filled with jars of pickled fairies, a chest full of Jesse James’s handkerchiefs, a library of leather-bound books on spells and sorcery, a locked cabinet rumored to be filled with American-Indian jewelry made of human parts, and a monstrously extensive collection of obscure folk, country, and psych albums, then you’ve probably only heard one or two of these songs. But that’s what is so great about covers records. When it’s very unlikely that most of us will ever get to spend time in said attic, Vetiver frontman Andy Cabic probably has, and rather than having to draw our own connections between Vetiver originals and what we might think could be some of their influences and inspirations, Cabic holds up twelve records as we take a quick peak into that dilapidated West-Coast-mansion-turned-hippy-commune-turned-eccentric’s-personal-museum’s attic. 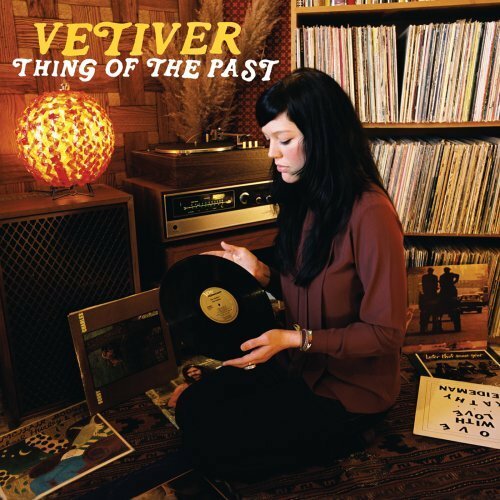 So, pull out your notepad, jot ‘em down real quick, get high, and then, without thinking about it too much, just listen to “Thing of the Past” as it twists these influences into the jolly slow moving cyclone that is Vetiver. Seriously, don’t be such a square. Just get high and listen to the album. Much like Bob Dylan’s self-titled first studio album of predominantly covers (and the slew of bootlegs), not only is it part of the folk tradition to do covers, but one of the many purposes songs are here on this planet is to midwife the birth and conceptualization of new artists. (I know it’s a bit hokey, but it’s appropriate when regarding the folk-psych-country genre, idn’t it?) And their lies the merit of this album. Proof of Cabic’s strong conceptualization of his own band. The trunk of the tree that is in the landscape that is the new-folk-psych-country genre. (Whatever you call it.) “Thing of the Past” is proof that the past is not only in the past, and if we’re lucky, the next guy that gets in that attic will use those leather-bound spellbooks to reincarnate that modern day Harry Smith’s record collection as new seedlings that have blown off the branches of the Vetiver tree. I loved your comments about “Lon Chaney” – it’s such a beautiful song with a great melody and lyrics and Vetiver did a great job covering it. There’s a cool fan video for Garland Jeffreys’ original version of “Lon Chaney” on his YouTube Channel: http://www.youtube.com/watch?v=kFwhTx_hVIQ. Very touching and sad visuals, but they fit the mournful quality of the song.